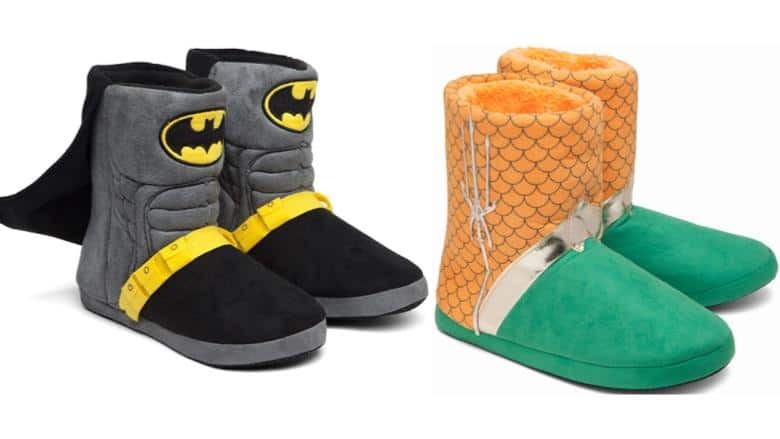 New Aquaman & Batman Slippers Available Now | Nerd Much? Before you die of cute, let’s take an official look at these adorably nerdy Aquaman and Batman slippers. Up first comes the Batman slippers made after the superhero’s original uniform. Not only do these little booties have their very own bat cape, but they also have bat-abs and a bat utility belt. The latter is unfortunately non-functional, so you won’t be able to store your favorite grappling gun inside. These Batman slippers might be a little too cute to fight crime on the streets of Gotham, but they are sure to keep your feet warm while you shuffle towards the closest cup of coffee. If you’re ready to show off your love for the classic Batman, you can get these dope Batman slippers from ThinkGeek for $39.99 USD. They come in two sizes, S/M (fitting a men’s 8-9 and women’s 10-11) and L/XL (fitting a men’s 10-11 and a women’s 12-13). Basically, if you’re a woman with a shoe size under 10, these slippers will be quite loose on you. Luckily, they are for household wear only and loose should be mean comfortable in this case. In second place for pure cuteness are the Aquaman slippers, which are actually a little cheaper at $29.99 USD. Probably because these do not have a spectacular crime-fighting cape. The sizes are the same as the Batman slippers, again little large if you’re under a women’s size 10. Instead, these booties have a silver Trident of Neptune which is as equally non-functional as the Batman slippers’ utility belt. You won’t be controlling the seven seas with these slippers, but you will look absolutely adorable. The customary bright colors of Aquaman’s classic uniform will always stand out and get your attention on those drowsy mornings or evenings. Regardless of which one you choose, these DC slippers are the perfect gift for this holiday season for a nerdy friend or personal present to yourself.